Saving my favorite for last! 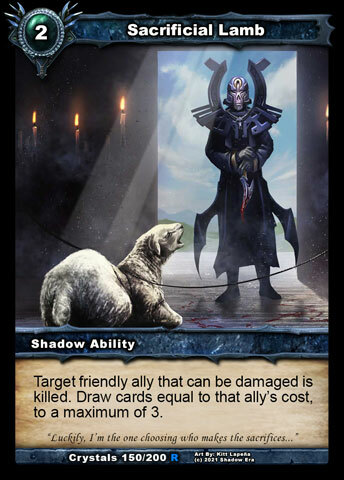 Shadow Mages of Shadow Era have often been consider the weaker faction because they generally relied on a later game style deck, while humans relied on a faster deck. The Shadow Mages in Call of the Crystals and Dark Prophecies typically revolved around Tome of Knowledge, Shadow Knight and Sacrificial Lamb. Shattered Fates bring lots of new toys that work really well including new Undead tribal things, Amulet of Conjuring and Flameforged Gauntlets. In additional, Gravebone received some boost with Crystal Shards and Falseblood Cultist. •Majiya – 4SE: Target opposing ally takes 3 fire damage. Draw a card. •Gravebone – 4SE: Return any ally from your graveyard back into play. •Raikka – 3SE: Until the start of your next turn, friendly allies have +1 attack and fire attack, and opposing allies and weapons have -1 attack. •Cryptspawn Tormentor(3cc – 3/4) When Cryptspawn Tormentor is killed by an ability while there are at least 2 Undead allies in your graveyard, Cryptspawn Tormentor is returned to its owner’s hand. 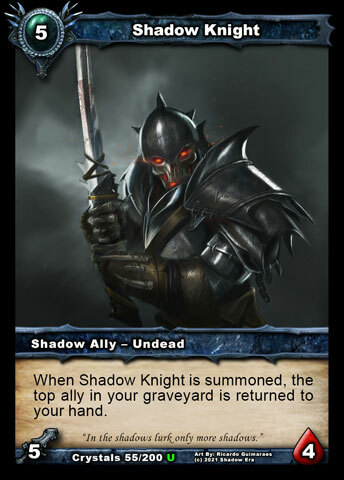 •Undying Bond (4cc) The top 2 allies in your graveyard are placed into your hand, and your undead allies have +1 attack until the start of your next turn. 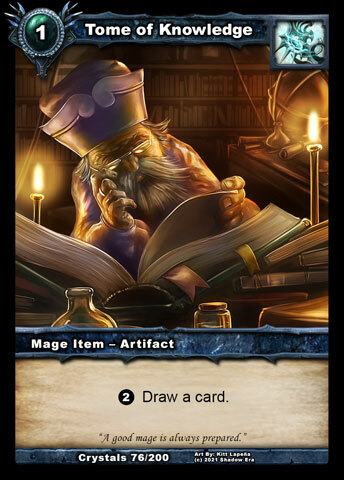 •Tome of Knowledge (2cc) 2: Draw a card. •Vial of Conjuring (4cc) 1SE: Draw 3 cards and remove 1 of your resources from play. •Twice-Enchanted Robes (5cc – 2/3) When your hero takes damage, draw a card. •Loest’s Burden (7cc – 4/2) At the start of your turn, your hero takes 1 damage. When an opponent uses shadow energy, you draw 2 cards. 0SE: Your hero takes 2 damage and you draw 2 cards. 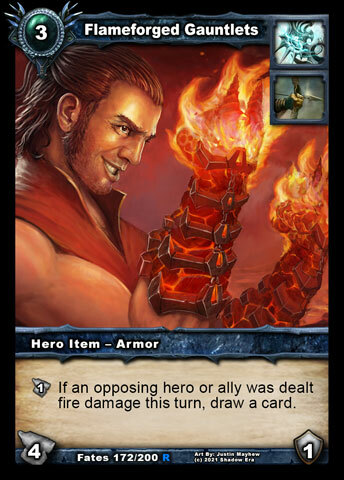 •Flameforged Gauntlets (3cc – 4/1) 1D: If an opposing hero or ally was dealt fire damage this turn, draw a card. 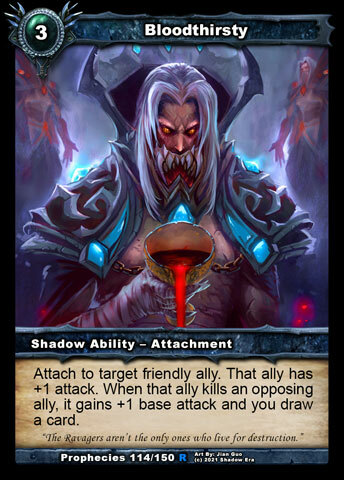 Tagged draw, Gravebone, heroes, Mage, Majiya, raikka, Sf, Shadow, Shadow era, shattered fates. « 2.88 Out on All Platforms!